Now a day’s the favorite junk food of young generation is pizza. Most of the people order pizza whether it be a party or a corporate event. Thought of veg and non- veg pizza brings the smile on the face of the people. Be. And today, when outdoor events are a crucial social meet, Outdoor Pizza Ovens are the ones that would suffice to the need of the hosts for serving pizza to the guests. Outdoor cooking differs substantially from kitchen-based cooking, the main difference being lack of kitchen area. These ovens are mainly used for huge gatherings and garden parties. How to build an Outdoor pizza Oven: Outdoor Pizza Ovens are made of high quality refractory and insulating materials. They are easy to install, easy to fire up, hold the heat for a longer period, compared to the indoor pizza ovens. These ovens are quite similar to the masonry ovens that were built during ancient ages to roast meat. Outdoor Pizza ovens are prepared by building a base in the beginning, where in piles of wood or charcoal are stored. Then the slab is built on top of which the pizzas are baked. The whole oven is covered by insulating material, preferably clay, so as to retain the maximum heat inside. How is the cooking done? A fire is built inside the oven. The fire burns which emits the heat and is absorbed by the oven walls. When the dome chamber inside the oven is heated properly as required, then the fire is allowed to die down or kept burning only very gently. The most common method of cooking in these ovens is that they store the heat while the oven is preheating and transmits it directly to the bottom of the pizza bread. 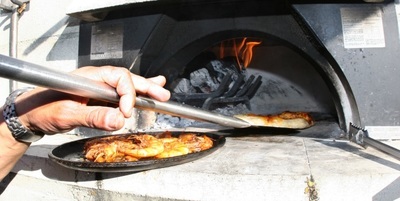 Outdoor Pizza ovens can also be used to roast meat and cook other baked dishes. Though most of these ovens are built on traditional technologies, the modern Outdoor pizza ovens are often fired using natural gas or electricity. Outdoor Pizza oven tools: The tools used while cooking over Outdoor Pizza ovens are generally made of steel or aluminum or wood and generally have long handles in order to save the hands of the chef from the oven heat or fire. Charcoal starter: This contains the charcoal used to fire up the oven. Baking steel: This is a round steel base used to provide higher temperature in the oven, playing as a heat catalyst abiding by metallic characteristics. Pizza pan: This is an aluminum pan to cook and serve the pizza. They come is different sizes. Infrared Thermometer: This is a handy tool that is used to measure the stone and roof temperature inside the pizza oven, during the process of cooking. Pizza peel: This is used to cut and serve the pizza, after it is baked and is ready as per the order placed. Pizza spinners: These pizza spinners are used to spin the pizza when it is inside the oven. Pizza Shovel: This is used to place the pizza dough directly on fire, during direct baking. Gloves: The gloves are required to be put on before taking out the pizza from the oven and serving hot. Pizzas are yummier when served fiery hot! Cleaning brush: This is used to clean the ashes left behind in the oven after cooking is completed. Outdoor Pizza ovens are thus quite a useful appliance to meet the need of baking and having delicious pizza, both indoor and outdoor.